It's no secret that The Secret Life of Pets was fun to watch from start to finish. I remember seeing a trailer for this movie last year. I thought the plot was simple but it appears promising because of the producers (Despicable Me). So I still looked forward to watching it. Finally, I got to see it with the kiddo today and with some amazing people (movie fans from a popular Philippine forum). The cinema was full packed with numerous kids tagging along their parents or vice-versa. I don't mind loud reactions from the audience, particularly the young (and young at heart). I was noisy too but I can't help it. It was entertaining from the moment we were seated (albeit running late) all the way till the movie credits rolled. Wait for the short teaser at the end by the way. Since the story is simple, kudos to everyone behind it. They were able to extend the run time effectively with entertaining twists from beginning to end. The pets' adventure along with how each and every character was characterized is certainly interesting enough. But don't expect anything else beyond that. The formula isn't for arm chair critiques looking for something deep. 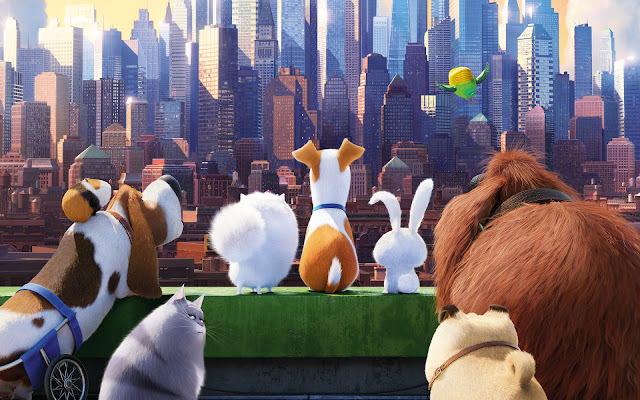 Secret Life of Pets also reminded me of Cats and Dogs (2001 - yes, it's an old probably forgotten flick) although cats and dogs joined forces here from opposing sides - domesticated pets versus wild ones (or at least city sewer dwelling, human hating ones). Both films featured the same type of villain - cute but deadly. Mr. Tinkles (a Persian cat) was as adorable as Snowball (a bunny). Both of them are also haters. The cat hated dogs obviously but the bunny hated pet owners. The contrasting cuteness versus the hatred for humans together with a gangsta, black guy from the hood personification makes Snowball a villain which may well be remembered longer than Mr. Tinkles. The rest of the voice cast were very effective too. If you want to watch a feel good vibe kind of film minus the need for critical thinking, The Secret Life of Pets is definitely recommended. It's a good weekend movie to de-stress or to bond with kids.